BlueWyvern: Here is a quick rules question... Is a in the following diagram a point or not? Black cannot force White to fill it in, but there is no denying it is a false eye. Charles In a seki, no points are counted on the board, assuming Japanese rules. Anonymous: So what is the score of this game? It seems like black has 3 points in the lower left corner, and that's all the territory? Aren't all the other groups in seki? That's 3 captured by White, and two by Black. 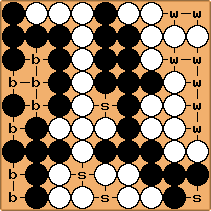 Given the context, we must be counting Japanese, so assume no previous captives: now the points marked b are Black's territory, and those marked w are White's: points marked s are involved in the seki and thus count for neither side. so Black has 7+2 = 9 points: White has 7+3 = 10 points. White wins by 1. My quick Chinese count comes out 40-40 - so that suggests that White must have captured something earlier in the game, I think! Scartol changed the As and Bs in this diagram to Ws and Bs to avoid confusion..
 Bill: With a net area score of 0, the territory score is also 0 if points are counted in seki. Counting the points in seki, the board territory score is -2 (2 points for White). That means that Black has captured 2 more stones than White. By Japanese scoring, then, Black wins by 1 point, since it does not count points in seki.